It’s almost time for the Giants to return to AT&T Park, and they’re giving you no excuse to miss the action this weekend vs. the Padres. On Friday, when Matt Cain opposes Greg Maddux for what seems like the one billionth time, fans can get $13 off selected tickets (use the code OMAR when ordering online) as part of the Giants’ night of honoring Omar Vizquel for breaking Luis Aparicio’s record for most games played at shortstop. Aparicio himself will be in attendance for the pregame ceremony honoring his fellow Venezuelan. And because it’s also Until There’s a Cure Night, there will be postgame fireworks. It’s also Orange Friday, so dress appropriately. More discounts come Sunday, when Tim Lincecum pitches. The Giants K Zone Offer takes $9 off selected tickets, since Lincecum, Tyler Walker and Brian Wilson combined to strike out nine batters Tuesday. Use code GIANTSK when ordering online. Fans attending Sunday’s game not only get to see Lincecum pitch, the first 20,000 receive a good-looking 50th Anniversary cap. In between, on Saturday, we get the interesting (but unrelated) combination of Marine Mammal Day (a Lou Seal favorite) and LDS Day. The first 5,000 fans who donate $5 to the Marine Mammal Center on Saturday will receive a commemorative pin. 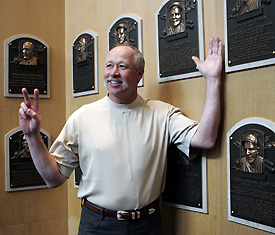 Goose Gossage, who’ll be inducted into the Baseball Hall of Fame in July, will be at AT&T Park on Friday as part of AutoTrader.com’s “Drive to a New Start” tour to benefit the Reviving Baseball in Inner Cities program and other youth outreach programs. Gossage will host a clinic for 20 Junior Giants players in the afternoon, then he’ll be in Willie Mays Plaza with the AutoTrader.com 2008 Chevy Tahoe, on which they’re collecting baseball celebrity signatures. 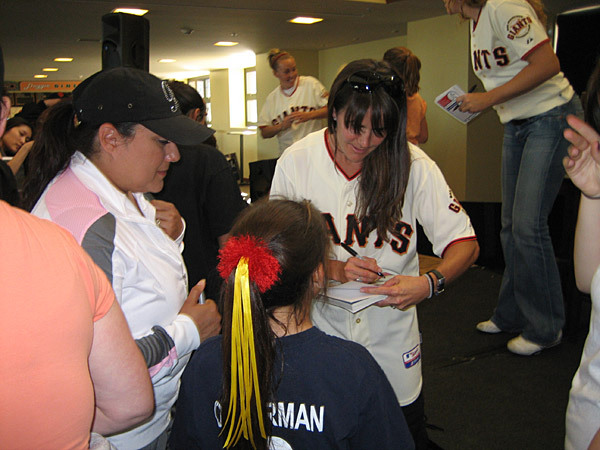 Each signature means a $1,000 donation to Junior Giants, up to $75,000. The vehicle, with all the signatures collected on the tour, will later be auctioned off and the proceeds divided among RBI and youth programs in each city on the tour. Fittingly, two of the teams for whom Gossage played are the Giants and White Sox, who meet up to begin Interleague Play on Friday night. The first Filipino Heritage Night at AT&T Park was definitely a success, with over 4,000 tickets sold, one of the largest numbers for a heritage event at the ballpark. The Likha Pilipino Folk Ensemble provided pregame entertainment, and it was pretty impressive, as many of the cultural entertainment groups are. Here’s a short clip of their performance; the music you hear is from a full on-field orchestra. Coming Friday: Japanese Heritage Night, featuring Masanori Murakami bobbleheads for those who purchased the special Heritage Night ticket package. And here’s a little Welcome to Third and King scoop for you: “Mashi,” the first Japanese player in the Majors, will be here in person as the Forever Giants Fridays special guest, signing autographs near the home bullpen from 5:45-6:15. He’s also featured on the season ticket for Friday’s game. 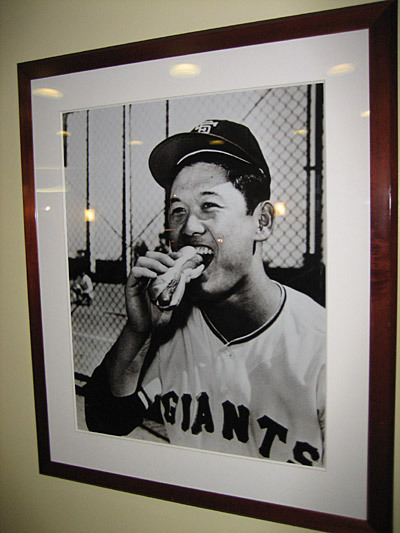 By the way, the photo to the left of Murakami enjoying his first hot dog is displayed on the Club Level of the ballpark. Time for more home decorating Tuesday, when the giveaway to the first 20,000 fans will be the second in the “Gamer” poster series, this one featuring Aaron Rowand. 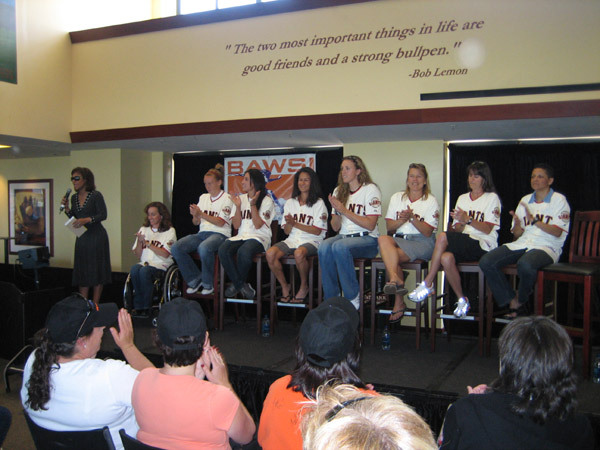 Special note for Thursday: After the 12:45 game vs. the Astros, the annual San Francisco Unified School District’s AAA High School Championship Game will be held at AT&T Park, pitting defending champion Lowell High School against George Washington High. 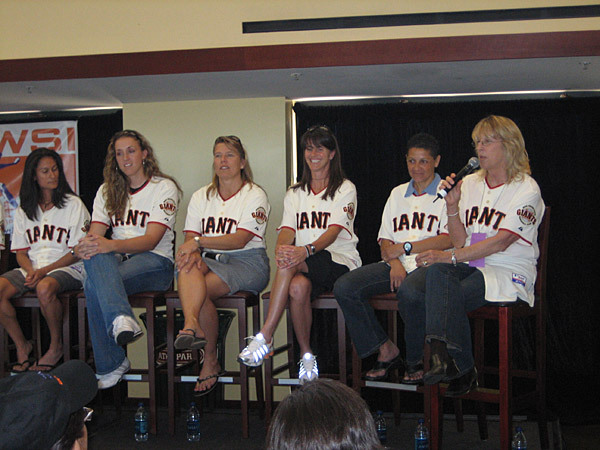 Admission is free, and fans already at the Giants game are encouraged to stay to watch and cheer for these young athletes getting to play in a Major League ballpark. 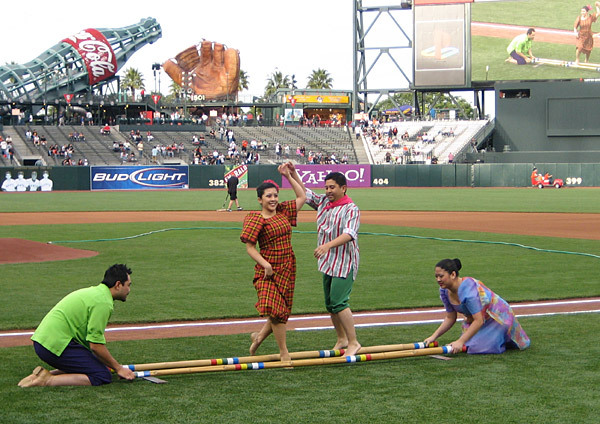 Monday kicks off Asian Heritage Week at AT&T Park, with four nights devoted to celebrating different Asian cultures. Fans who buy special tickets sit in the heritage night seating section and receive a special Giants-themed gift available only to those with the special tickets. Even if you don’t have tickets for the special seating section or commemorative gift, each night will include pregame and in-game cultural entertainment. Check out a couple of videos, one from last Friday’s Mexican Heritage Night, featuring the Xiuhcoatl Aztec Dancers, and one of a lion dance troupe from last year’s Chinese Heritage Night. 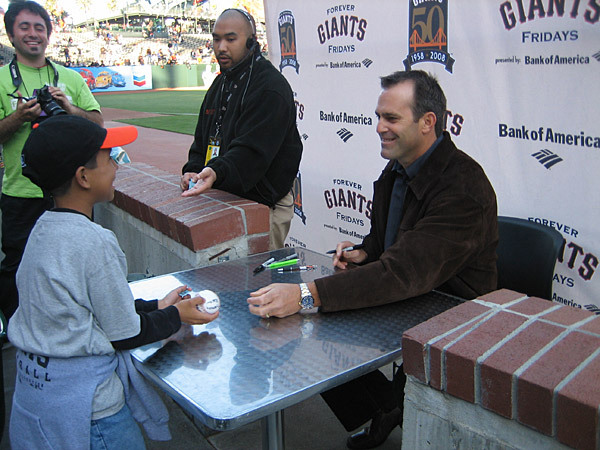 Boy, Saturday was quite an exciting day at AT&T Park, starting with the Junior Giants Glove Drive (photos to come soon), Aaron Rowand receiving his 2007 Gold Glove Award, Tim Lincecum’s dazzling performance and the season debut of Omar Vizquel. Sunday will also be a great day at the yard as the Giants and Major League Baseball mark Mother’s Day with efforts to help fight breast cancer. As part of Genentech Strike Out Cancer Day, the first 20,000 fans will receive special pink Giants caps, and as part of MLB’s “Going to Bat Against Breast Cancer” program in association with Susan G. Komen for the Cure, players will wear pink wristbands, titanium necklaces and ribbons, pink logos will appear on bases and home plate, pink lineup cards will be in the dugout and players will use pink bats that will later be autographed and auctioned, along with the special home plates, on MLB.com to raise funds for Susan G. Komen for the Cure. In case you need another good last-minute reason to attend tonight’s game (assuming the K Zone offer for $5 off select tickets hadn’t already enticed you), it’s Commemorative Croix de Candlestick Night on this Orange Friday. In 1983, the Giants launched a promotion to celebrate those hardy souls who stuck it out for an extra-innings night game at Candlestick Park, awarding a Croix de Candlestick pin. You can tell the true diehards from the Candlestick days by the rows of orange pins circling their caps. Tonight’s pin is a black version, but it still boasts the motto from the original pin: Veni Vidi Vixi (“I came, I saw, I lived”). Almost forgot: It’s also Forever Giants Friday, and tonight’s special guest, who’ll be signing autographs down the third-base line before the game, is shortstop Johnnie LeMaster. 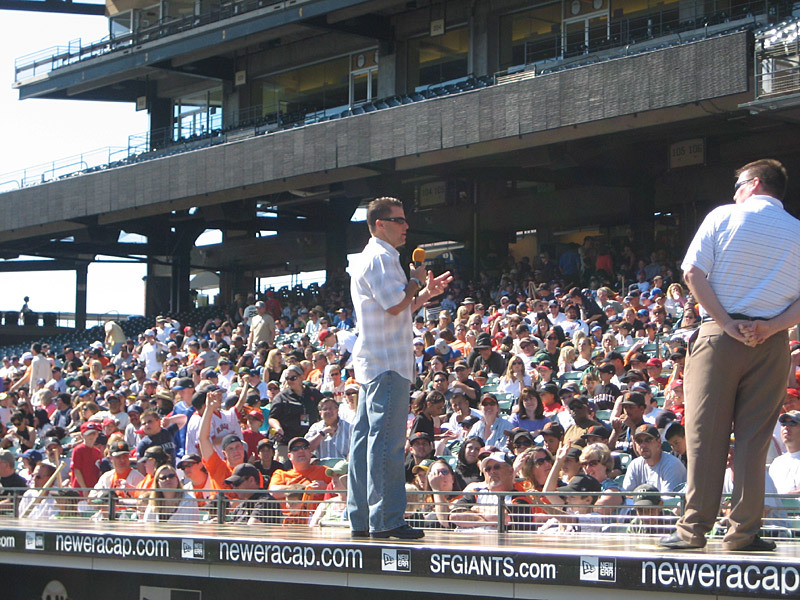 Here’s a shot from the last Forever Giants Friday, with Robb Nen. The end of the last homestand included a couple of pregame events at the ballpark that were pretty inspiring for kids (and adults): BAWSI Night and Little League Day. 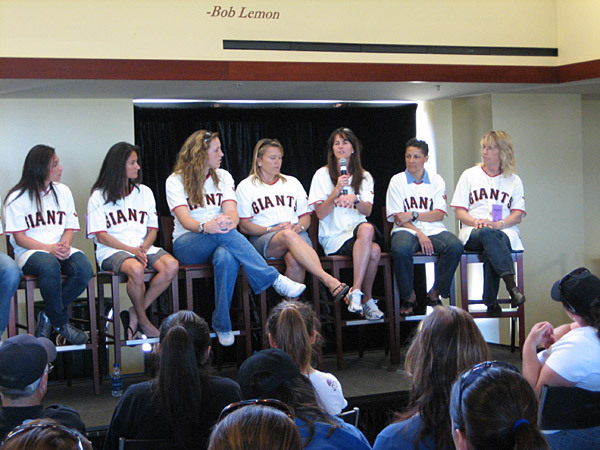 The Bay Area Women’s Sports Initiative held its first ballpark event on Saturday night, inviting a panel of distinguished female athletes to speak and sign autographs. 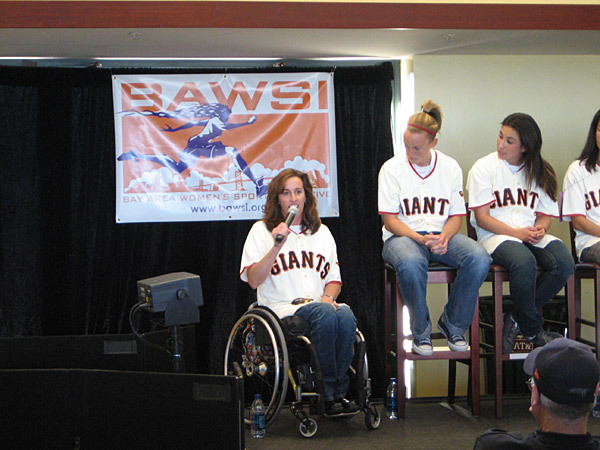 These are women who have had to fight for their place in the sports world, from Anne Cribbs speaking about how after winning a gold medal at the 1960 Olympics, she had to stop swimming because her college had no program for women, to Sharon Kelleher talking about getting involved in wheelchair sports after a car accident left her paralyzed. Each of the women shared uplifting and challenging moments from their lives, as well as words of advice for the girls in the audience — BAWSI (“bossy”) girls. More photos from the event are at the bottom of this entry. On Sunday, bright and early, a huge number of Little Leaguers descended on the ballpark for a pregame presentation by Mike Krukow, J.T. Snow, Brian Wilson, Matt Cain, Aaron Rowand and others. They also got to parade around the field before the game. Snow talked about challenging moments in his baseball life, coaching his son’s Little League team and his famous grab of Darren Baker in the 2002 World Series, among other topics, while Wilson got a laugh when he was asked how many homers he’d given up (he declined to answer).